One of the most overlooked components of any car stereo system is the head unit. The head unit is the stereo system interface on the dashboard of your car, allowing you to control what you listen to and more through either buttons or a touchscreen. There are thousands of different kinds of head units, with different brands, makes, models, and styles, all vying for the unique privilege of finding a new home inside your vehicle. With so many different options, how do you know which car audio head unit is best? 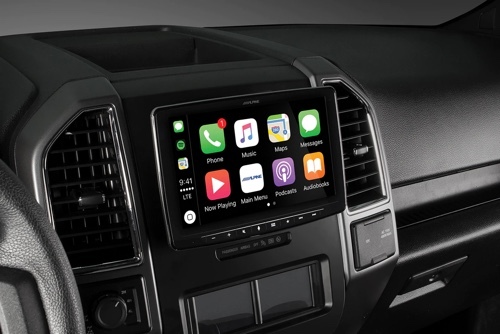 San Diego Car Stereo has years of experience working with car audio and are car audio experts, and after much deliberation we have come to the conclusion that the best head unit for car audio is the Alpine Halo iLX-F309. To learn more about the Alpine Halo, call San Diego Car Stereo at (858) 569-0777. What Makes the Alpine Halo the Best Car Audio Head Unit? The Alpine Halo iLX-F309 is a 9-inch head unit that acts as both an audio and video receiver. The Alpine Halo has a number of unique features that make it stand out as the best head unit. Below are a few of the best Alpine Halo features. Apple CarPlay and Android Auto allow for instant access to some of your smartphone’s favorite apps and services, including but not limited to Maps, Waze, Spotify, Apple Music, Amazon Music, Google Music, Podcasts, Audiobooks, Siri, and much more! Apple CarPlay and Android Auto make for the safest and most comfortable driving solution, as you can easily make phone calls, read and answer text messages, and listen to your favorite form of entertainment while behind the wheel. One truly unique feature of the Alpine Halo iLX-F309 is the attached adjustable mount. This allows the screen to sit in front of your vehicle’s existing dashboard, allowing installation into any and all vehicles without blocking air vents or existing buttons on your dashboard. Depending on the positioning of the head unit you can also angle the screen so that you can easily and efficiently access the touchscreen. You can also have the head unit permanently installed into your vehicle by an experienced car stereo installation expert. The Alpine Halo touchscreen is specially designed to reduce the glare on the screen, allowing you to easily see the screen no matter the time of day. Bluetooth car audio is a necessary feature nowadays, and sure enough the Alpine Halo comes equipped with Bluetooth compatibility. Wirelessly connect with your smartphone to make and receive phone calls. The head unit features an HDMI port, allowing you to connect audio and video to your car stereo head unit. No matter the song, video, or other media, you will be able to listen and watch it on your Alpine Halo iLX-F309. The Alpine Halo iLX-F309 is compatible with most backup cameras, rear cameras, and side cameras. The camera is sold separately, but if you wish to add a backup camera your head unit is ready. If you are looking for a new head unit for your car stereo system, go with the best head unit on the market. The Alpine Halo iLX-F309 offers an amazing combination of new features, reliability, and quality that is impossible to match, providing you with the perfect head unit for your car audio system. If you are interested in learning more about the Alpine Halo iLX-F309 or want a quote on installation, contact San Diego Car Stereo. We are the car audio experts and are ready to give you the car stereo system of your dreams! Give us a call today at (858) 569-0777. Newer PostWhat Apps Can Be Used With Apple CarPlay? Older PostWhat are the Best Motorcycle Speakers & Audio Systems?